Session 9 is a taut thriller - very creepy and unsettling. More than just spooky voices and sounds, this film is long on atmosphere and sure to give you a few good scares and chills. 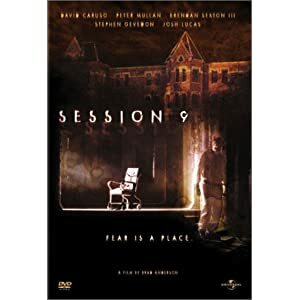 Session 9 was shot in a real life asylum that closed in the 80s. The filmmakers used the eerie atmosphere of the abandoned building to create fear and dread. The plot: Gordon Fleming and his crew work for a company that cleans up hazardous materials. They are asked to get rid of the asbestos in an old mental hospital. While working there, they discover some files that tell about nine sexual abuses that happened in the asylum. After this discovery, strange and horrifying incidents begin to occur, testing the will and sanity of every worker in Fleming’s crew.